In each year of our five-year cooperative agreement with the National Library of Medicine, the New England region provides a special kind of outreach, called “Focused Outreach” to specified, medically-underserved areas in New England. Bangor, Maine was identified as this year’s urban, focused outreach area and Quiet Corner, Connecticut was identified as the rural, focused outreach area. The purpose of the focused outreach is to identify and become acquainted with new community, health-related organizations and to address the health information needs these organizations identify as most important in their community. The Education and Outreach Coordinators use a semi-structured interviewing method to conduct key informant interviews with the organizations they would like to glean information from. The interview questions are related to how community members get their health information and what are the most pressing health issues in their community. The next step is to implement a tailored approach to address the needs identified using the framework of the NNLM NER and its resources. Together the NER and those who participated in the interviews create a plan that often involves community “train the trainer” outreach education and projects, directed to health care and public health professionals, librarians, and consumers. My colleague Sarah Levin-Lederer and I have recently been involved in a successful focused outreach project in Quiet Corner, Connecticut. 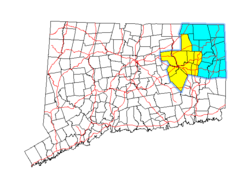 Quiet Corner is also known as Northeastern Connecticut and it encompasses Windham County, eastern sections of Tolland County, and the Northern portion of New London County. Quiet Corner is more rural than southern or central Connecticut. July through August of 2018 Sarah and I conducted 12 key informant interviews. 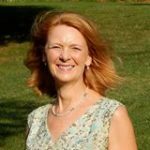 The needs the interviewees conveyed related to lack of resources for effectively treating those with mental health and substance use disorder challenges. Another need identified was the lack of reliable transportation for patients to get to health and dental appointments. Lastly, food insecurity and lack of resources to educate the community about best practices for healthy eating were identified. With the help of the interviewers Sarah and I implemented 2 community events to address the needs identified. Quinebaug Valley Community College (QVCC) graciously hosted both of these community events. On February 22nd we held a Resource Sharing Day for those supporting patrons, clients, patients and students. In the morning, Gerry Thorington, LISW, from the State Department of Mental Health and Addiction Services presented strategies for providing the best possible service to a challenging population often suffering from mental health or substance use disorder health issues. We learned dialogue and participated in hands-on practice for active and reflective listening, validating emotions and achieving a win/win situation for all parties involved. Next, Sarah and I presented a brief overview of NLM’s consumer health website MedlinePlus as well as an introduction to the NLM and the NNLM. 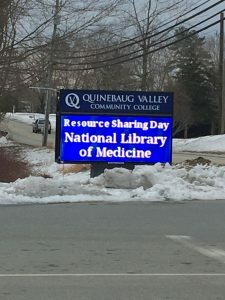 In the afternoon, each organization participating in Resource Sharing Day provided an overview of their services the resources they offer to the community. This exercise was eye-opening as many participants learned about resources they could draw on from their colleagues right in their own community. The second event, Strategies to Alleviate Food Insecurity: Nutrition and Food Education from Cooking Matters, Connecticut https://www.cookingmattersct.org/ was held on 3.29.19. Cooking Matters is a national program that works to ensure low income families have access to nutrition education, smart grocery shopping strategies along with hands-on food preparation techniques and recipes to eat healthy on a limited budget. 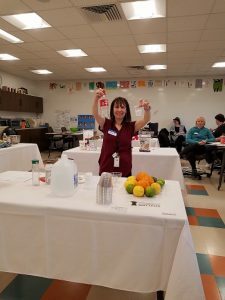 Seventeen participants participated in this event learning about the MyPlate model for healthy eating, reading nutrition labels, and how to calculate the amount of sugar and fat are in our food based on the information provided on the nutrition label. We also put on our aprons and made our own lunch using some of the quick, nutritious and economical, chef-developed recipes Cooking Matters provides. We worked in groups preparing our lunch of Hummus, Fall Vegetable Salad, Yogurt Parfaits and Fruit Sodas. We all learned a lot about nutrition and enjoyed this “hands-on” opportunity to prepare some healthy and delicious food provided by this event. If you are interested in making some of the Cooking Matters recipes, download the free Cooking Matters app for both IOS and Android devices.